The Best Exercises to Fix Bad Posture–How to Get Rid of That Humpback Fast! 02 Jan The Best Exercises to Fix Bad Posture–How to Get Rid of That Humpback Fast! 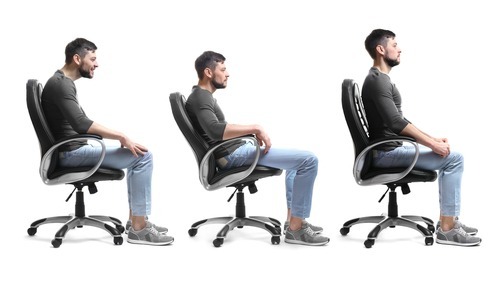 If you aren’t already aware there’s a huge problem today as far as people having poor posture, and its dams a lot deeper than this generation being more prone to being couch potatoes than their parents and grandparents. The fact is that nowadays most of us who live in the United States or in the western world work in the service industry, which by and large requires people to sit in a chair at a desk for hours on end. Doing so while sticking your neck out and having your high is glued to computer screen isn’t exactly what one would call a natural position and thus is something that highly contributes to a bad posture seen in so many of us today. Not only does having bad posture look bad as it can give you the appearance of having less confidence as many of us know it can have negative health implications as well. First a person will experience minor pain usually in the lower back on the neck which can progress into something worse. This bad posture is not just going to make you feel more pain and generally worse during the day but it’s going to affect your gains as well if you’re someone who frequents the gym. Being in the same position for 8 hours a day is going to cause an imbalance in your muscles and in posture which you can fix through proper stretching an exercise. Your are some of the most effective stretches and exercises to help you improve your posture. While it’s not going to be possible for everyone to do so do to the type of career they have or their employer, if you have the ability to do so get up and move around as often as you can. If you work sitting at a desk ideally you want to get up and move around every half hour or hour at the maximum, to give the your muscles a well needed stretch. You have to remember that your muscles act in a similar manner to rubber bands, having them in the same fixed position long periods of time is going to keep them stiff, which can only be remedied with a good long stretch. Obviously it is unreasonable to expect to get a full workout at some point during your workday however there are certain muscle groups in areas of the body you can definitely exercise at work. The two major areas you want target are your neck and your forearms as these tend to be two major problem areas. Doing forearm stretches and hand stretches prior to starting your workday can really help to reduce the instances getting carpal tunnel which is definitely something of a concern of people who do a decent amount of work on the computer. Obviously there’s going to be activities figure going to do in between going to work and going home such as going to the gym and going out to dinner or are doing whatever other type of activity you have planned for the day. The real challenges when you get home however as this is where we are most comfortable and is also what are we tend to do the most damage to our bodies. While coming home after a long hard day of work and plopping down on the couch may be something you’ve been craving all day it’s not going to do a posture any good. While at home when you’re watching TV eating dinner or doing whatever other leisurely activity you want to do so in a chair or on a couch that’s going to give you some good support. A wooden hardback chair is going to do your back more favors than sitting on a plush chair overall it may not be preferable as far as comforts concerned. Another thing to keep in mind here is the 30 minute to 1 hour rule has you going to want to get up periodically to move around in stretch to get your blood flowing. It can really be tempting to just plop down after work and be a couch potato until it’s time for bed however it’s going to lead to more problems down the line.